Hungarian sculptor; born 1815; died in Budapest June 29, 1902. His father, a poor merchant, destined him for the rabbinate, and had him educated accordingly at the yeshibah of Presburg. But he soon deserted his Talmudic studies and went to Vienna, where he apprenticed himself to a wood-carver. The latter was soon convinced that the boy had great talent for wood-and bone-carving, and he helped him to enter the Academy of Art, where he remained till 1838. While a student he won two prizes. After having worked for some time in Munich and Paris, Engel went to London, where, from a simple stone-carver, he became a distinguished sculptor. His busts of Queen Victoria and Prince Consort Albert drew the attention of the Austrian ambassador at the court of St. James, Prince Paul Esterhazy, to the talented young Hungarian; and through the prince's intervention Engel entered the Academy of Sculpture, where he passed several years and won many prizes. His first work of importance was a group of statuary, "Amazons Fighting," which was bought by Prince Albert for £600. This group is now in the royal residence, Osborne, House, Isle of Wight. 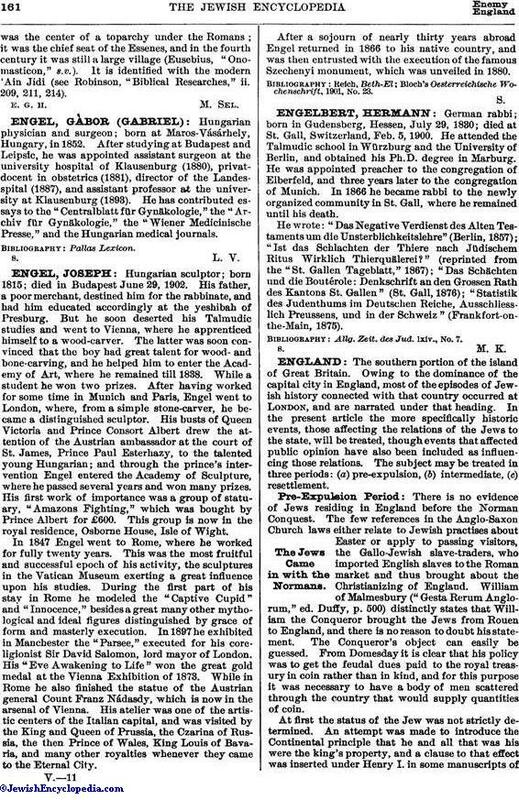 In 1847 Engel went to Rome, where he worked for fully twenty years. This was the most fruitful and successful epoch of his activity, the sculptures in the Vatican Museum exerting a great influence upon his studies. During the first part of his stay in Rome he modeled the "Captive Cupid" and "Innocence," besides a great many other mythological and ideal figures distinguished by grace of form and masterly execution. In 1897 he exhibited in Manchester the "Parsee," executed for his coreligionist Sir David Salomon, lord mayor of London. His "Eve Awakening to Life" won the great gold medal at the Vienna Exhibition of 1873. While in Rome he also finished the statue of the Austrian general Count Franz Nádasdy, which is now in the arsenal of Vienna. His atelier was one of the artistic centers of the Italian capital, and was visited by the King and Queen of Prussia, the Czarina of Russia, the then Prince of Wales, King Louis of Bavaria, and many other royalties whenever they came to the Eternal City. After a sojourn of nearly thirty years abroad Engel returned in 1866 to his native country, and was then entrusted with the execution of the famous Szechenyi monument, which was unveiled in 1880. Bloch's Oesterreichische Wochenschrift, 1901, No. 23.